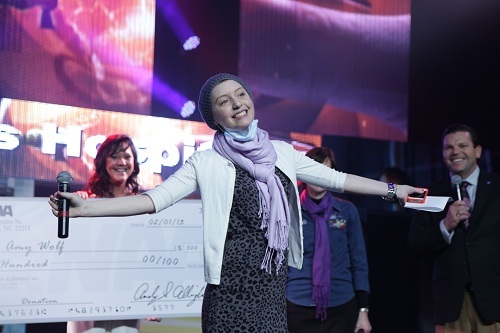 RALEIGH, N.C. – High school senior Amy Wolf shared her story about her battle with cancer at National Agents Alliance’s National Convention on Feb. 1. Wolf spent time sharing the story of her diagnosis, her care at Duke and her current road to recovery. Andy and Jane Albright presented checks to Wolf and Duke Children’s Hospital and Health Center at the event. Just before her junior year, Wolf was diagnosed with Non-Hodgkin lymphoma, and has spent the past year and a half in the care of the doctors and nurses at Duke Children’s Hospital. Wolf was very grateful for the excellent care she received at Duke, and gives credit to the doctors and nurses who helped her fight the cancer. Wolf described the pre-diagnosis treatments, as well as the diagnosis and treatment processes, from the initial antibiotics prescriptions to the chemo, radiation and bone marrow transplants. Throughout all of her treatments, she said, the doctors and nurses at Duke were kind and attentive. Today, Wolf is cancer-free and down to one clinic visit per week. Her health is improving and the future is looking bright. To learn more about Amy Wolf, visit her blog to read about her treatment and recovery. To learn more about Duke Children’s Hospital and Health Center, visit their website. National Agents Alliance volunteered at the MIX 101.5 WRAL-FM Radiothon for Duke Children’s Hospital and Health Center. Wolf and her family were family ambassadors for this two-day fundraiser that raised $1.12 million this week. Note: All comments are subject to moderation. Please see our commenting policy for more details. Become an National Agents Alliance agent today through our simple application process.